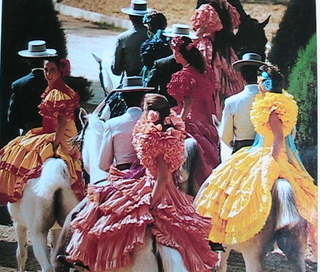 The unique romantic image of brightly colored, flouncy ruffled , multi-tiered-dressed beautiful women with high heels and flowers in their hair on the bare back of exquisitely regal stallions, behind handsome men in tailored suits, hats and chaps made me swoon at first sight on a post card as I arrived in Andalusia! I knew instantly that it was something I just had to see in person. 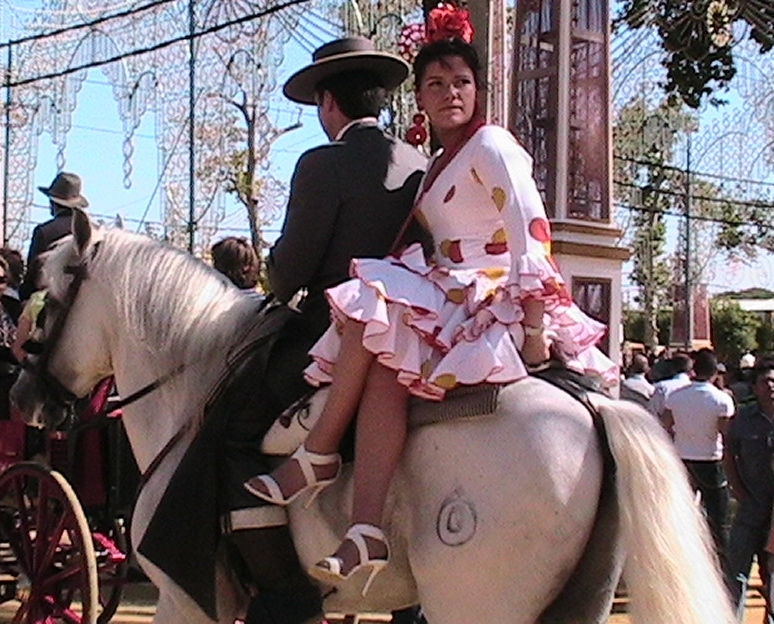 This takes place everywhere during festivals in Andalusia, but the very best place to see this sight in person is at the world famous Jerez Horse Fair ("Feria del Caballo") that takes place every year at the beginning of May. It has been going on since 1284. We missed it last year because we had to visit Morocco before it got hot. We were going to catch it this year after a quick trip to Morocco, but due to the delays with revamping our website, we had to keep moving our exit date up. We thought, "okay, we can cut out Morocco and see Jerez as our first stop" when we first extended our exit date from April 15th to May 1st. When we moved it up to May 15th, we had to go to plan C. When you travel by whim, it is always good to have a few alternative plans, but I was determined not to miss this festival this year. It did not disappoint and I highly recommend that you see it if you ever have the chance! We loved it so much that we hope to go again next year. 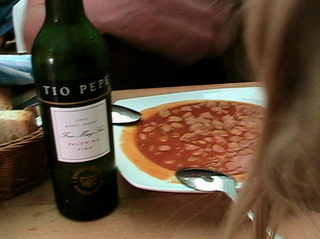 It is all just so distinctly Spain and the very best of the Andalusian culture. Jerez is the center for sherry, a very important area for flamenco and the home of the famous Andalucian School of Equestrian Art. 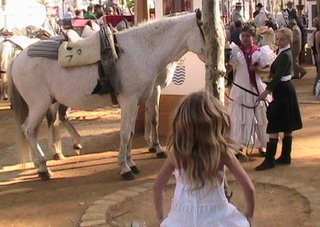 You will recall that we saw visited last year with family and saw the famous horse show, but this fair made a much more powerful impression. We are all so ready now to hit the road and this was a good chance to test out some work that we had done on our motor home and get back into our moving groove. We were thrilled to take a week end off and very glad to leave the laptops behind, especially me ,after being tied to it day and night recently. We needed a break and Mozart was beside herself with joy to be back on the road, even though it was almost a five hour drive each way. We decided not to bring any electronics except our camera and GPS because we knew we would be leaving the RV parked in a city for hours on its own. It is an enjoyable drive along the coast with views and always fun to pass the massive rock of Gibraltar. This area of Andalusia is much flatter and has a very different look than our very mountainous area.The ocean views were stunning and all the wild flowers in bloom added to my pleasure. We thought about going two days to the fair, but since we needed a rest, we decided to just relax our first day and found a lovely campsite by a nearby beach. I will write more about that part of our get away in my next post. I have too many good pictures that I want to share, to combine them. Grin. 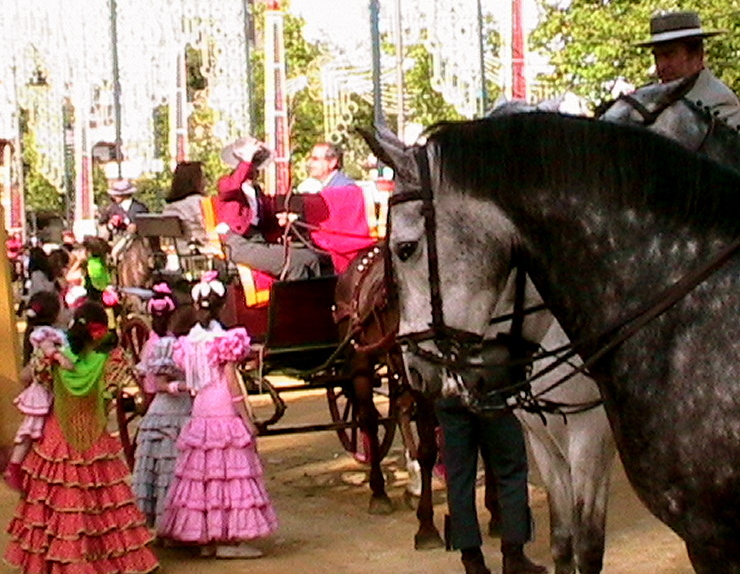 There are bull fights, fireworks and lots of horse activities at this fair, but my primary motivation was to see and photograph the sights and just experience the ambiance of such a large fiesta. 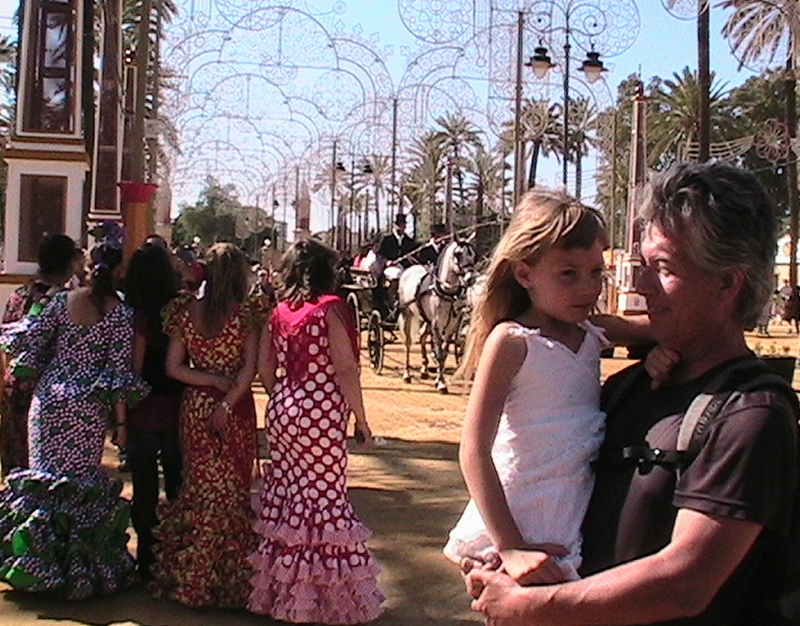 It was not overly crowded like Semana Santa in Seville last year, so very pleasant to just walk around in this huge park that is turned into a city within a city. 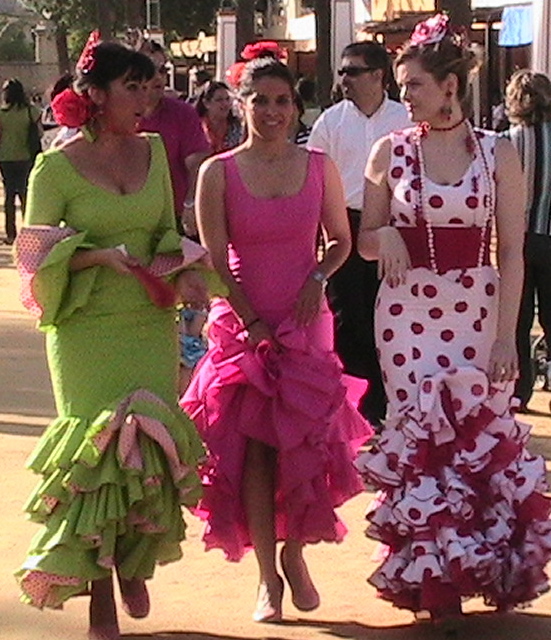 Many people are dressed in the traditional clothes and it really makes you want to put on one of those dresses to and start dancing some flamenco! Between about four in the afternoon until seven in the evening, there is a kind of constant parade on the main dirt streets of the park. They are lined with over two hundred casetas that are set up and open for all to enjoy. There was a cute moment when we were strolling along. 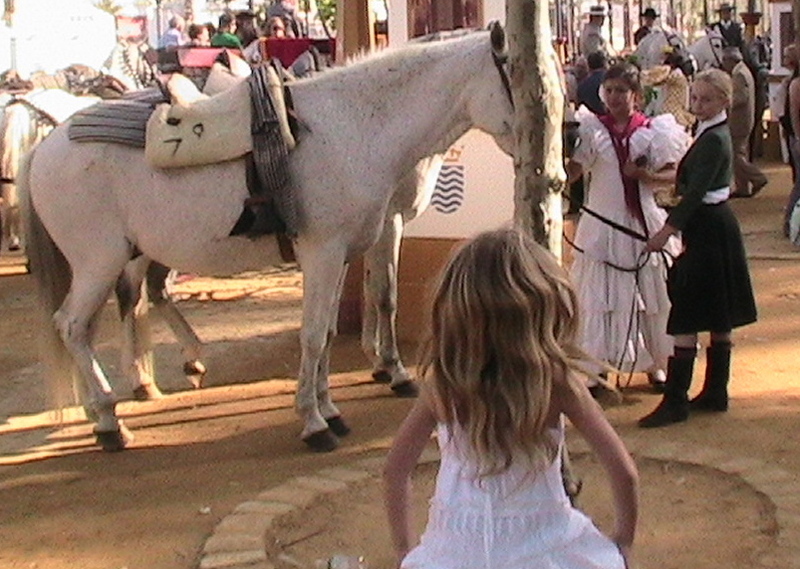 Mozart was feeling the music and broke out into her own flamenco routine next to two young girls who were holding their horses. I realized how much Andalusia is in our blood now. 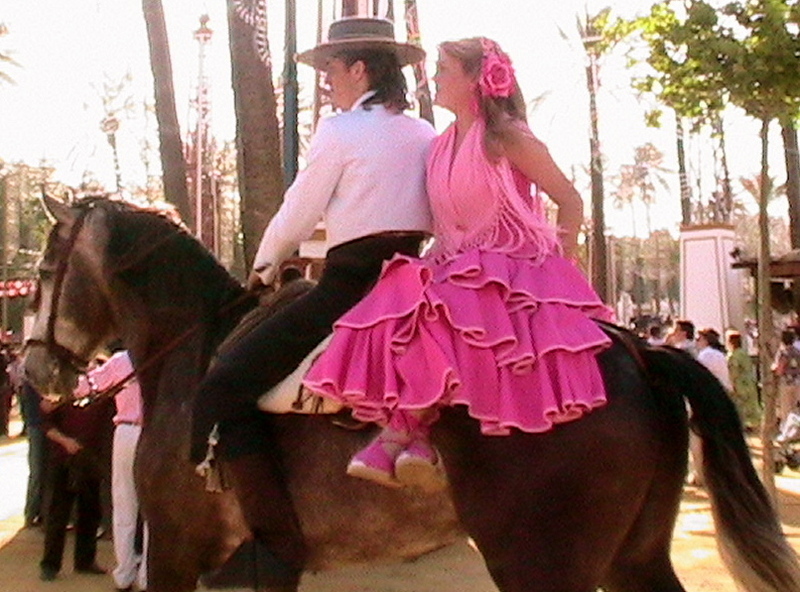 It is hard to explain the excitement of seeing all of these beautiful horses and the women and girls in one gorgeous flamenco dress after another. They are like flowers on heels and even if one does not ride, suddenly you feel tempted to grab some reins. 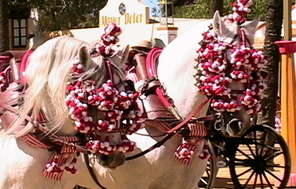 The antique carriages and elaborate dressage on the horses impress. The music adds another dimension and we really lucked out in that area. After just wandering and taking a ton of pictures and some video, we tried to figure out where to have something to eat. We walked into one place where many were dancing the Sevillana which is always fun to watch. It was a little hectic though, so we moved on and found the most perfect little spot just as we were ready to take a break and get out of the sun for a while. The flamenco music was sublime which added to the mood and there were pictures of this older woman on the walls and a flat screen color TV playing videos of her performing. 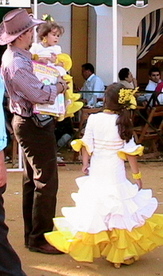 One of the great things about flamenco is that older women are honored and cherished, so it is not just young singers. This woman sang from childhood into her seventies. The waitress was very kind and helped us come up with some traditional dishes which were delicious. One was some kind of bean and shrimp dish and the other was a Spanish style omelet which is more like a quiche and we all picked at each. We had not liked the sherry when we went to the tasting in Jerez last year, but that is the only wine they serve here and some how it tasted very good in this setting. Mozart wanted her own little sherry glass too and we all did our famous Soultravelers3 toast that Mozart made up. 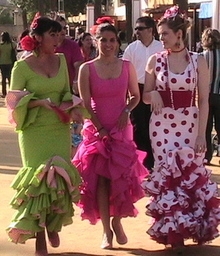 I have friends on the Fodor's forum who know a lot about Flamenco. They helped me discover who we were listening to as it was hard to decipher precisely what the waitress was saying at times. She did mention that this singer was considered the Queen of Flamenco in Jerez and that she died a short time ago. Her singing really added a magical tone to an already enchanting day! Love the photos - the colors are all so bright and wonderful. Your descriptions of the Jerez Horse Fair make it come alive. I am so glad you liked the photos, especially encouraging because you are a professional photographer! Every time I see your posts I'm always inspired by what you are doing with your family. I can't help but think what a wonderful gift you are giving, not just to your daughter, but to everyone who wants to do something big, daring and life fulfilling. It's brought me some European sunshine on a cloudy Cleveland morning. Welcome to our blog Ivana! Thank you so much for your beautifully written, kind words. Isn't is great how we can inspire and bring sunshine to each other? So glad that we met through twitter! Sounds like a wonderful time by all. Great pictures! Be well. Looking forward to you next stop. Thanks Piroska! I appreciate your comments. I enjoyed the photos and descriptions, too. They do look like "flowers on heels!" What an amazing life you and your family are sharing. And, thanks for sharing it with the rest of us! This isn't related to this post in particular, although I enjoyed it very much, but I wanted to mention that I've been following your blog for quite a long time, and it's a real pleasure to read. I love all the pictures and your excellent stories, and your daughter sounds lovely! Thank you so much for sharing your adventures! I'm going on my own RTW trip in a year, and your blog really gets my mind going. :) Thanks again! Hello Elizabeth! Thanks so much for commenting and letting us know that you have enjoyed our blog! It is great to hear and we appreciate your kind remarks. It is really neat for us to "meet" people who have been following us. How exciting that you will be going on your own RTW trip! Have fun in the dreaming & prep phase & know that it will be even more fun than you imagine when you set off!! Great pictures! So colorful and creative, as your life of travels. Thanks Bjean! DaVinci is having a great birthday in the Algarve in Portugal!